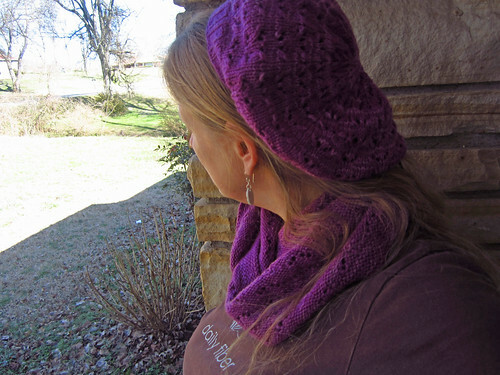 Here’s what I cast on yesterday after finishing the Sweet Tea Slouch, which we will get to in a minute. 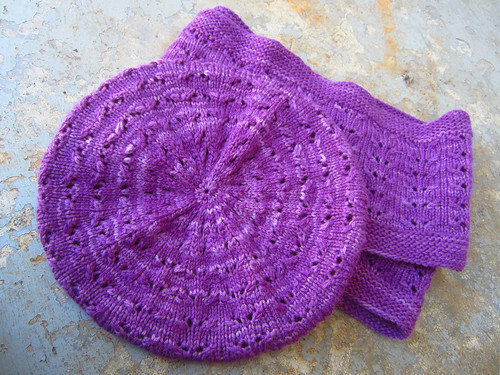 If you recall I mentioned that I am test knitting the Spiral Effect Cowl which Heather knit in one of my hand painted variegated colors, Malignant Narcissism, so I decided to use a solid for mine. This is one of the new colors we will be dyeing up soon. I just ordered 265 pounds of yarn today and when it arrives, we will skein it all and start dyeing more yarn for the spring and early summer shows. We are planning to do one new hand painted variegated color and two semi-solids. 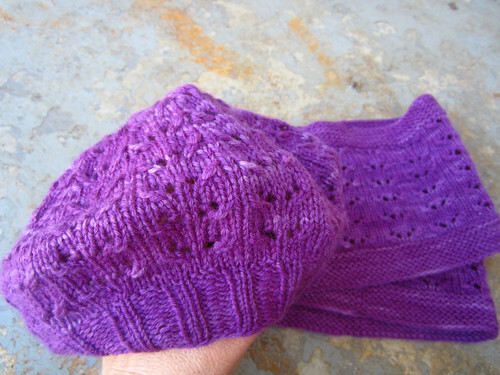 I already have the variegated color-way planned, since it is one I used for a sock club a couple years ago. It’s called Earthshine. I am thinking that I will mix up a new orange or a purple for the other solid. The above green is as yet un-named. Feel free to offer suggestions. 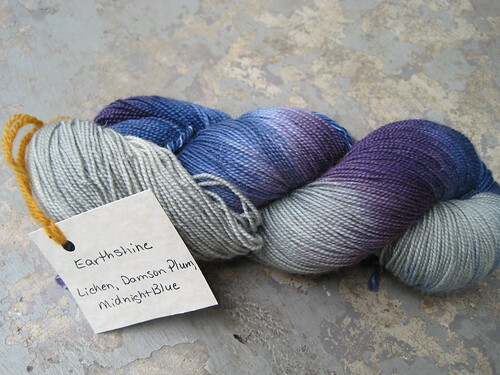 I am sending this test skein of Earthshine to Heather to work up a new design. 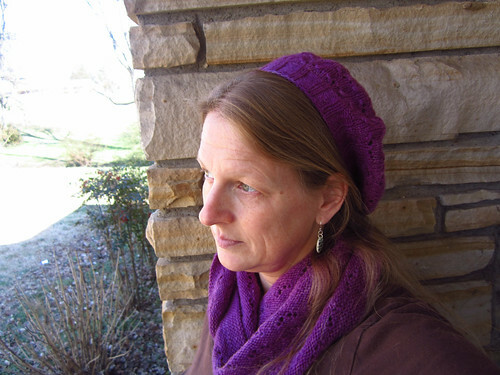 We both seem to be on a cowl bender, since I keep knitting them and she said she has another idea for one. So, that’s the plan. I can’t wait to see her idea and to see this color-way knit up. 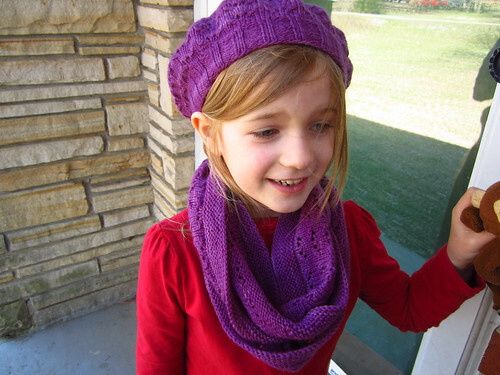 Now for the Sweet Tea scarf and hat set; I love the cowl and the hat is adorable, but I don’t think it is quite as cute on me as it is on my 6 year old. LOL! Here she is wearing it. Adorable, right? I just have one of those faces/heads that don’t do hats well. Here are some less interesting on the porch shots. The color frustrates my camera, even in neutral lighting. The ones above where Emma is wearing them show the color more accurately, but still not exactly right. It is a much more red-violet color. Sigh. My camera hates saturated blues, reds, and purples. I haven’t talked much lately about my music and reading, so how about an update? 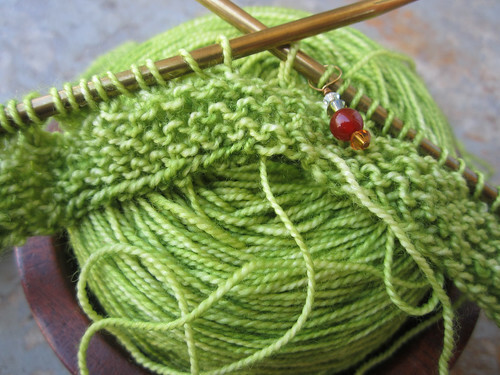 I am still working my way through the Outlander series by Diana Gabaldon right now, as well as dipping in to my new Principles of Knitting, which is a book that I can highly recommend to every knitter. It is so packed full of information. I know, we have the internet now, and that is a valid point, but I am still a firm believer in having books too. It’s a great reference point for those times when don’t have access to the internet for whatever reason. Not to mention it’s fun to just read. Well I think so anyway. I am up to the 5th book of the Outlander series, The Fiery Cross, and am about 60% of the way through it. I must say that thus far I liked the 3rd and 4th books the best because they stuck much more to the personal conflicts and there was less political events woven into the story. Due to the time period and setting there is, in the 5th book, the rumblings of the tax issues during the pre-American Revolutionary period, which gets tedious to me. I know that some people probably love that detail, but it doesn’t hold my interest as much. It does add some realism and depth to the plot, but I could do with less of it. The book is 1300+ pages, so maybe there could have been some more editing? What am I listening to lately? I got the new Van Halen album when it came out last week. Anybody else? I was very skeptical when I heard the single Tattoo it when released. I was not instantly impressed and almost wrote off the album. But…when I heard the raves about the album, I had to see for myself. On first listen, I was not totally blown away, but it was certainly good and worth getting to know. It took several more times through to warm up to it. I am a firm believer in listening to albums in their context since the songs are meant to be played that way most of the time. As a whole this is some of the best material they have put out since the mid 80’s. I never liked the Sammy Hagar albums. The album that I am REALLY waiting for is the new Rush Album, Clockwork Angels, which is rumored to be released in May 2012. I can hardly wait! Okay, I’ll close for now. See ya next time. 2) Green Tea for your solid? It sort of looks like the yummy green tea from Panera. 3) You know I would vote for another purple, but a nice coppery-orange could be lovely, too. I was thinking of a mauvy type purple, or if I do orange(more likely actually) a coppery bright orange is already what I had in mind. Great minds think alike. LOL! That WOULD be perfect, wouldn’t it? What a lovely springy green! Just the thing to look at while waiting for actual spring to arrive. And I just realized that I was signed in with the wrong account….hope I don’t cause too much confusion!